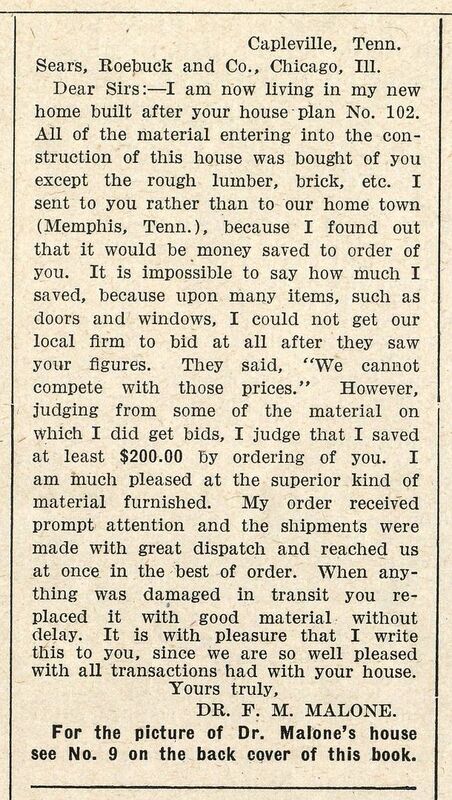 Early this morning, I posted the information about Dr. Malone and his Sears Hamilton at a forum and a kind soul did some research on her own and sent me this link. That link sends you to a narrative, written by Dr. Malone’s daughter. It’s an incredibly detailed life about growing up in the Sears house in Capleville. It’s a long detailed (and wonderful) story, and I’ve reprinted a few highlights below. I spent many hours in the swing on the front porch at Mama and Papa’s. That way I could see the patients who came to Papa (Dr. F.M. Malone) for any and all their ills. The Dr’s office had an entrance off the screened porch, back side. Real often I sneeked around to listen to their complaints. On one such day I heard Papa ask the man, who had given his name as Bob Jones, if Jim Jones was any relation. The man said, “Lawsy, Doc., He’s liable to be My Pa”. 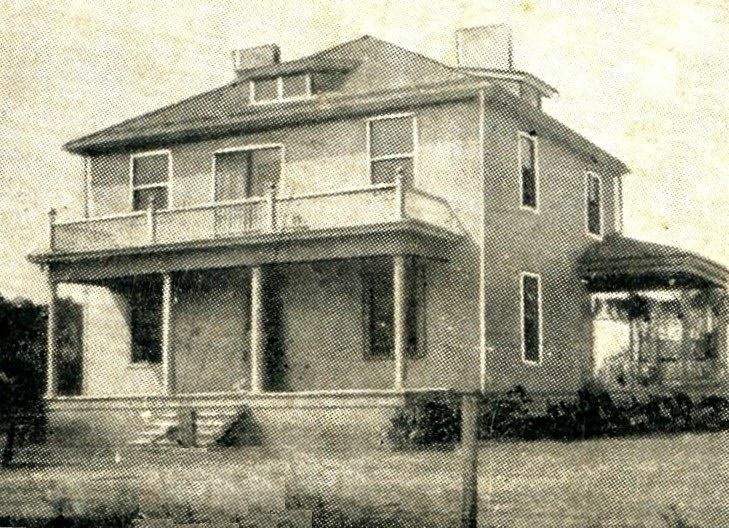 The “big house” as referred to by Kiline, had a parlor on one side dawn stairs troll and Papa’s office on the other. They were separated by a front hall with sliding doors. The stairway in the front hall went to 4 large bedrooms & one bath room. There was no running water, but a tub was in the bath roost. Water for the tub had to be brought up the steps by buckets. However there was a drain for the dirty water to run out. Down stairs, behind the parlor was the dinning roost, butlers pantry and kitchen. The screened in porch off from the kitchen housed the cistern, with a pump. A door in the kitchen went down to the cellar. To some it might have been a basement. Canned goods, sweet potatoes, & empty jars found a home there. If there was a storm brewing Mama always rounded us all up to find shelter there too. There was a fire place in each room, but in the winter Mama & Papa’s bed room was the only one heated after supper. Everyone gathered there. Since there was no radio or T.V. we played games. Dominoes and Logomiky were favorites. Logomiky was cards that had beautiful pictures and letters to spell with. Often Papa entertained me with post cards that he had saved from far away places. He kept them in his desk by the fireplace. Sometimes Mama was busy with sewing. The back bed room, with a stairway to the attic didn’t have a fireplace. The attic fascinated me. I could imagine a store place of wonderful things. Forbidden to go there, made it all the more interesting. One day Maxey and I, slipped away from the adults and crawled up on our hands and knees. The opening was one big hole. Soon we were disillusioned and ready to come down. Now, if I could just find the living descendants of Dr. Malone and/or the current owners of this fine old house! 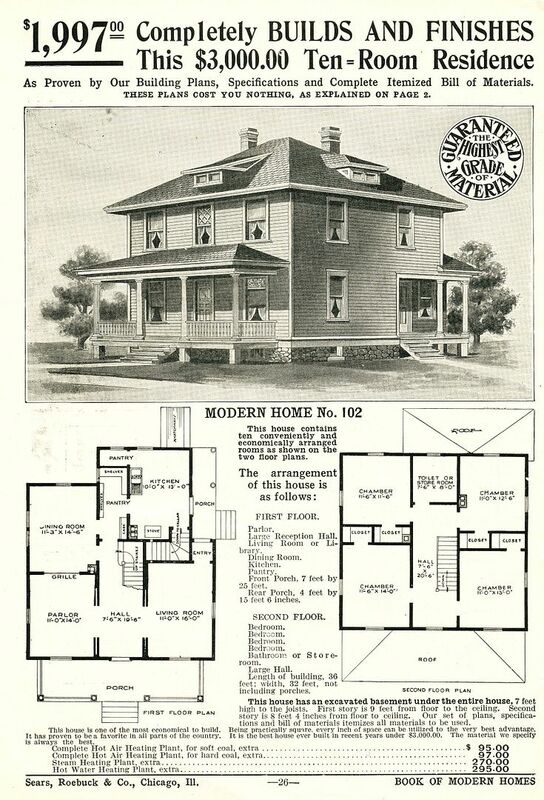 Sears Hamilton, as seen in the 1908 catalog. Dr. F. M. Malone's own "Hamilton" in Capleville, TN, shortly after it was built in 1909. Dr. Malone spoke in glowing terms about his new Sears Home. To read the prior blog (Part I), click here. And like I also posted, the house address shows to have been 421 Pleasant Hill Road. There is a large pond there. Having been a farm this pond was handy I am sure. It appears to be an industrial area somewhat now. To the west, I think it is west, is Malone Road. I believe his farm and property was quite large. Maybe Mark can locate the plat info? You might try contacting this person : tom@tommcknight.com It appears that he maintains the family website. As thorough as it is I bet he has information and photographs. I bet he would be interested in this information. This shows the Malone Homestead which is where I said it was earlier. The house was at 421 Pleasant Hill Road. Thanks very much Rachel. I’ve sent him an email. I’ll let you know what I hear back! I hope you have the google satellite link I provided elsewhere and have been able to examine that house on 5075 Malone Rd from all angles. It certainly seems to me that it could be Dr. Malone’s house, added onto and remodelled, of course. It sits well back from the road, which goes along with the narrative provided by the Malone granddaughter(? )’s recollection. It is close to the still operating Burdick Church, which she also mentions. From the Shelby County tax assessor’s website, I think that the owners of the house at 5075 Malone Rd are Darrell W and Virginia P Orman. http://www.assessor.shelby.tn.us/content.aspx If you think it inappropriate to include these names her, please edit them out. They are however public info. If you enter the 5075 Malone address into http://www.historicaerials.com, you can see land photos of the area made in several years, as well as topological maps from several years. It appears to me that beginning in 1953 the land around was mostly still farms, but by the 1970 there was beginning to be mining in the area, probably gravel mining, if my memory of living in& outside of Memphis is correct. You can also see that the presence of ponds changed a lot over the years. Especially in the yellow square area that Rachel linked above, there occurred at least 7 new ponds. That is typical of gravel mining. So any ponds seen on modern maps cannot be assured to have been there in the past. On the other hand, I also see some ponds were filled in over time. I mention the ponds, in part because I have been using a “Pac-Man” shaped pond as a landmark to help myself find the 5075 address over time. There is also a small creek that seems to run along the property and northeast toward the railroad yard. It is most clear on the oldest flyover photos, when there were far fewer trees. Today, 5075 Malone Rd is somewhat cleared of trees, as though a lawn is maintained near the house. Otherwise it has come to be surrounded by forest, as you can see both on the google satellite and in the most recent historicaerials.com photo. The property has been subdivided off of the original square it was part of, and according to the tax office it is now only 8 acres. So it is hard to spot on photos if you aren’t clear what you are looking for–Just a slight gap in the woods nowadays. And the creek can no longer be discerned. Oh, in the 1953 aerial photos you can see lines (fences and hedgerows) of the property divisions still largely in those big squares which actually overlap the state line. Don’t know if it interests you, but I think those squares are evidence of the ownership by Andrew Jackson! Jackson owned pretty much all this part of the state (and surrounding states!) as a result of his land speculation preceded by driving out the Indian residents in order to get the land. (The place where I grew up was originally deeded by Jackson, too.) I think the big squares were how he divided the land for sales. If anyone wanted to get into it, they could probably follow Dr Malone’s property back to Andrew Jackson. Malone may have owned an entire square, multiple squares, or parts of, depending on how subsequent divisions may have been done. Oops, that would be Burdette Church. Just found the statement on tommcknight.com that the house was on the extreme southwest corner of the homestead. That might put it not in Cableville, TN, but in Mississippi. The original real estate squares overlapped the states. With Google, I do see an old house or three in that area, but seemingly not of the style in DR Malone’s photo. I wonder how big the Malone farm might have been. Two, three, four squares? Immense enough to encompass the area where the house at 5075 Malone is ? Well, I have enjoyed looking at the question. The House mentioned in the south west homestead map location belonged to Dr. Franklin Jefferson Malone. Dr. Ferdinand Madden Malone’s house was located at 421 Pleasant Hill Road like Rachel mentioned previously. That site http://www.historicaerials.com you mentioned is great. You can see the house with all its dormers on 421 Pleasant Hill Road in the 1950s but in the 1971 map it is gone. The house at 5075 Malone Rd can not be Dr Malone’s house. It does not match the catalog image. The house at 5075 Malone Rd is wider than it is deep which is the opposite of the Sears No 102. The Sears No 102 measures 32′ wide and 29′-36′ deep. Another difference is the house at 5075 Malone Rd has a bay window on the back that is on both stories. The front on that side has an extension of a few feet on the first level. The Sears No 102 does not have a side bay window on the back or a bump out on the front side. Imagine the Sears No 102 from above, and yes chimneys and dormers come and go. This is not the same house at all.